There are few comprehensive accounts of Western seekers drawn to Eastern spirituality in the early decades of the 20th century. And fewer accounts still which depict interactions and exchanges of a high order with Ramana Maharshi, Krishnamurti, Anandamayi Ma and the rare born mystic Sunyata, among others. Drawing upon Ethel Merston's intimate diaries and an unpublished memoir, Mary Ellen Korman provides readers with a vivid and detailed chronicle of a time when intelligent people were searching in earnest for a path of knowledge that would lead beyond the day's materialism to genuine understanding and, ultimately, Being. could afford except one, her mother's love. Riddled with anger, the young woman became a patient of Maurice Nicoll, one of the leading psychologists of Analytic Psychology developed by the Swiss psychiatrist Carl Jung. The therapy did little to alleviate her anger and so in 1919 she discontinued it, only to return to Nicoll three years later. Taught from childhood to be keenly observant, Ethel at once detected changes in Nicoll that she rightly sensed originated in a contact with a higher form of knowledge. Later that year Ethel attended a lecture at The Quest Society on the Fourth Dimension by P.D. Ouspensky. Recognizing Ouspensky's formulations as parallel to Nicoll's, she questioned Nicoll closely at their next session. He finally admitted that Ouspensky was his teacher and agreed to take her to the next meeting. In her diary, Ethel writes that the "talk was all about the marvelous cures, real miracles," of a G. I. Gurdjieff who was about to open an institute outside Paris. Ethel had long suffered back pain that she had become convinced was related to her anger at her mother. Seeking Gurdjieff's help, she was among the first to enter his institute at the Château de Prieuré and so unwittingly encountered first-hand the teaching of The Fourth Way. Due to her excellent administrative skills, developed during military service in World War I, Ethel was soon named director of the Prieuré for the times when Gurdjieff was away in Paris. Overseeing a diverse group of headstrong English and Russian students and children was no easy task. (Fritz Peters gives an account of her tribulations in his classic Boyhood with Gurdjieff, in which he calls her Miss Madison.) Korman presents Merston's side of the encounter, letting us see for the first time the reasons for, and feelings behind, what Peters remembered. Unknown to most historians of the Work, while at the Prieuré, she was one of the key translators of Gurdjieff's Beelzebub's Tales to His Grandson, All and Everything. Her reasons for leaving in 1927 remain unclear, but throughout her life she would maintain contact with the Work and Gurdjieffians, in her final years writing the first glossary to Gurdjieff's book. Despite Gurdjieff's strong warning regarding the rise of theosophy and psychoanalysishe called them both "pseudo-teachings"Ethel became involved with the London Theosophical Society for a time. 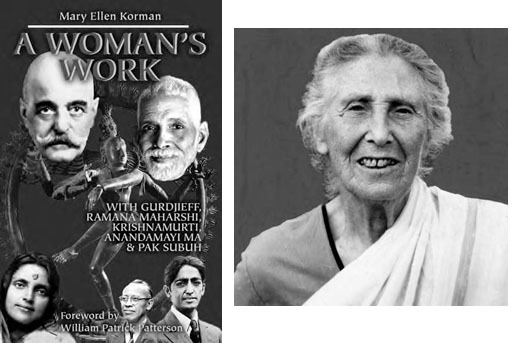 She also explored spiritualism with the mediums Eileen Garrett and Edgar Cayce before eventually settling in India. There she met and traveled with Anandamayi Ma, and she gives a first-person account of Ma's meeting with The Mother at Sri Aurobindo's ashram, as well as her time with Krishnamurti and Ramana Maharshi. She finally takes Ramana Maharshi as her guru and has a cottage built at his ashram, where she will spend the remainder of her life. She is there to record the sage's final days in his bout with cancer. A Woman's Work takes a leading place among that small handful of books which offer us a rare glimpse of what it was like to meet and study with many of the key spiritual figures of the last century.